0 Comments Published by Tiffany on Friday, February 23, 2007 at 6:11 PM. There were guys before you; there have been a handful since. But you're the only one I still see in my dreams. 3 Comments Published by Tiffany on at 10:43 AM. 1 Comments Published by Tiffany on Wednesday, February 14, 2007 at 11:10 AM. 2 Comments Published by Tiffany on at 7:45 AM. 2 Comments Published by Tiffany on Saturday, February 03, 2007 at 2:57 PM. When we were in England last October, we had a special treat. We had one day off, and as a group, couldn't decide what to do with it. So we turned the money over to Michelle, and she planned our day. She done good. We had a day in Italy. 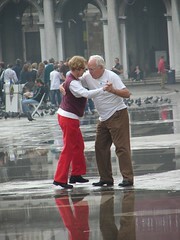 Specifically, in Venice. It was an amazing day, perfect in the end, so I thought I'd tell you all about it. We stayed in a hostel in Bologna, which is about 2 hours away by train. So we got up obscenely early to catch a train to Venice. We had to take a bus from the hostel to the bus station, only a 20 minute ride. In theory. We split into two groups unintentionally. Most of the group headed out to the bus stop early, but 4 of us ended up running a few minutes behind them. Well, the 4 of us missed the only morning bus, and ended up having to walk about 2 miles of that toward town. Finally we got on a bus that took us to the station, arriving just minutes before our train left. We missed breakfast, but we figured that we'd just grab something from the cafe car. But our train didn't have a cafe car, it turned out. Don't worry, the day gets better. 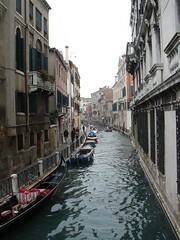 We finally arrived in Venice just before 11:00 a.m. It was beautiful. The weather hovered right around 70 degrees all day, and since it was past tourist season, the city wasn't too crowded. We didn't have a guide book or anything, since we didn't know where we were going, so we bought a map at the train station and decided to just wander. St. Marks, the cathedral, was south of the station, so we just started walking. Venice looks pretty much like every movie you've ever seen set in Venice. It was almost Disney-esque, it was so perfect. We were all pretty hungry at this point, and Lynn and I were both needing a coffee fix, so we decided to find somewhere to eat. We entered a little piazza with a cafe with outdoor tables. We went inside to order, and the owner and his wife helped us, even though neither of them spoke a word of English, and none of us spoke Italian. But we managed to order cappucinos, pizzas, and calzones. We sat outside in the sun and just people-watched. We realized pretty quickly that we were the only non-Italians around. Apparently, we found a place the locals eat. The food was beyond description. The coffee was the best I've ever had. Couples, families, kids playing soccer, all wandered past while we ate. At one point, a dog trotted across the little square, and Lynn pointed out that it was an Italian dog. As in, if she said, "Here, boy! ", it wouldn't know what she meant. As we finished up, the bells of a nearby church rang out the noon hour. Moments later, another bell joined, and then another, until every bell in the city was part of the chorus. Yes, I cried; it moved me deeply. It was a moment I'll never forget. After lunch, we continued our meanderings. We got lost several times, but finally made it to the market, the Rialto bridge, and St. Marks' Square. Now, I'm not one who likes to look like a tourist. In fact, I hate it. But I went into full-on tourist mode that day. Saying, "wow" at every turn, taking way too many pictures, the whole deal. But I didn't care. There was a small strings orchestra playing at an outdoor restaurant, and a couple tangoed in the square just outside of it. A newlywed couple strolled through in full bridal garb, having their pictures taken. 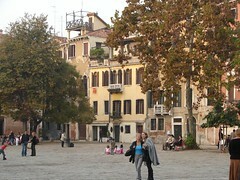 The piazza was swarming with people, but was still vast and intimidating. After an hour or so of taking pictures of the square and cathedral from every possible angle, we stopped at a cafe along the lagoon. A couple of glasses of red wine, some tiramisu, and another cappucino later, we all had our postcards written and addressed and were ready to head back to the train station. We went back through the market, the better to obtain souvenirs and gifts for people back home. We ran into one of the guys on our team, and walked back up to the station, where he had arranged to meet the others on our team for dinner. We all went to dinner at a couple of different places. 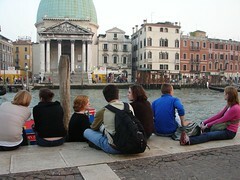 My group ended up at a romantic (wasted) little place right on the Grand Canale. We had amazing pasta and another bottle or so of red wine. Then it was back on the train to Bologna to get ready to go back to England. So it was definitely a highlight of the trip, and actually one of the best days of the year. Kudos to Michelle for putting it together for us.